We've just received photos from a customer's finished table, for the top of which we supplied some beautiful wood. The wood itself is from our reclaimed old growth heart pine, sturdy as a rock. We happened to have some lovely pieces we did not need for a 3/4" tongue-in-groove flooring order. Rather than throw it out as unusable, our customers were able to repurpose it into a functional design. It's surprising how well pieces intended for a floor can, by a simple metamorphosis, serve as furniture, or a surface off which you can eat. I believe the idea of having dinner at something normally swept, mopped, muddied, and stepped on, and cleaned again might appear strange on first consideration, but the fact that a floor can survive a century of foot-traffic yields an equally sturdy, as well as a slim table. So have a glance: does this seem to have been meant as a floor? We have plenty more pieces of excess flooring we'd love to see repurposed, so if you have an idea please contact us. The wood itself, after years sunk in the riverbed, has achieved a singular durability and coloration, and, having been submerged for so long, remains nearly untouched by decay of time. It's the arboreal mercantile cousin of Browne's buried urnes. But how they came to us, and how we laid them as floor itself has history. The wood itself was originally used for Savannah's colonial wharf system, begun around 1791, which served as the point of access and departure for the colonists' supply and trade. Due to the steep bluff upon which the city rested, and the presence of tides, an efficient and tall wharf was necessary. The wharf was so efficiently built, and the wood so strong, that, aside from maintenance, it was not fully replaced until 20th century by steel and concrete. The wood is mostly old growth longleaf pine, older than even the colonists, or tidewater cypress, some of which over a millennium old. The trunks of these trees were cut and shaved, points were shaped into the ends, and were pile driven some 15 feet into the silt and mud riverbed, into an oxygenless depth. By 2008, the wharf itself was only a cracked skeleton of its former living bulk. Though the parts extruding at low tide here seem weatherbeaten and gnarled, the buried length had preserved itself from time by a sort of mummification. Due to the absence of oxygen, rot was held at bay, and the logs petrified. To extract these deeply stuck pilings, now cemented into the riverbed by suction through ages, a barge equipped with a vibratory pile extractor, which essentially shook them loose and pulled them free. They were then hauled out, trascined out of the tide range, and stacked. Notice the beauty and tightness of the annular rings, as well as the thorough coloration, dyed from the river. The pilings were then loaded onto our tailer and hauled off to a mill with a saw capable of handling their immensity and solid heart. Until they looked this clean and uniform. Even cleaned up the river's coloration is still quite visible. The result is a historic wood finish, with more character than even our reclaimed wood, due to the coloration and strength. One may literally walk along some of the oldest wood in the country, even older than the colony itself. 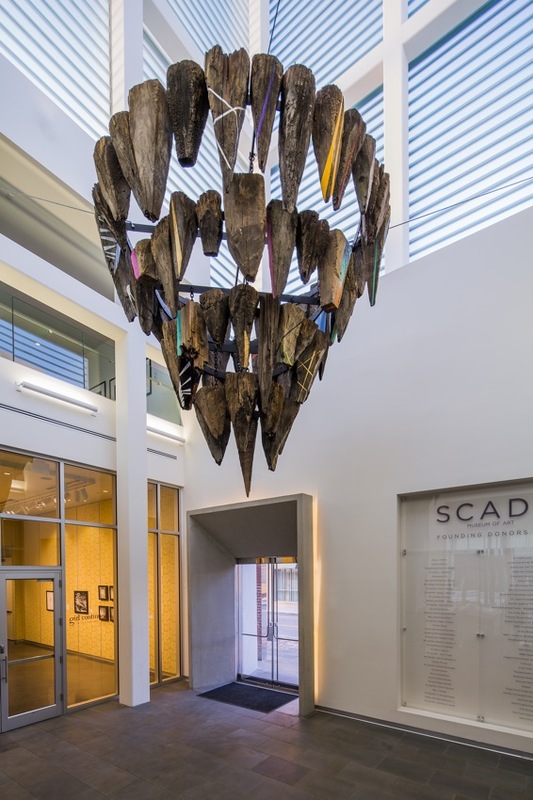 Other than our typical uses, this wood has found itself used as lighting, or in art shows, the original points being excellent sculptural elements. For example, a point featured in our friend Marv Graff's recent exhibition. Photo courtesy of Marv Graff. Photo courtesy of Whitewall Magazine. We still have quite a few logs and points of this rare wood left, and would love to provide it for furniture or flooring. If you're interested, please contact us. We were happy to receive pictures of one of our client's finished products: a rustic farm table and matching bench. They were made using some lovely pieces of our reclaimed wood. The end product looks wonderful and truly displays great repurpose of our wood. The strength of the boards allow for a very low-profile table top, rather than a large clunky kind typically found on farm tables, but the aged wood allows for the rustic look desired. These pieces exhibit a nice blend of subtlety and art while maintaining their purpose: a table and bench. Savannah Grey Bricks on Sale! Update! Due to the great interest taken in our Savannah Grey bricks (the local newspaper even covered them! ), and that we stumbled upon another salvage job brimming with many many more, we've decided to put another 3,000 on sale. These bricks are much cleaner than any we've encountered so far, as they've rested untouched since they were laid in the 19th century. Two exposed sections of the subterranean brick wall, likely how they've been for over a century. They were uncovered in perhaps one of the few remaining original Savannah structures which incorporated them extensively. I'll certainly be writing more about these lovely bricks, their provenance, and former occupation as we uncover more details about the location. Until then, "sut seeing they arose as they lay, almost in silence among us, at least in short account suddenly passed over; we were very unwilling they should die again, and be buried twice among us." As we're clearing out our inventory, we decided it was time to place our beautiful Savannah Grey bricks on sale, 10,000 of them to be precise. Considering the ever growing scarcity of these hand made bricks, it's surprising (even to us) that we were able to collect as many as we have, although our decades of renovation and deconstruction work in Savannah has certainly assisted! As we've written elsewhere, our Savannah grey bricks (all Savannah grey bricks) date back to the early 1800s, and were hand made at the McAlpin plantation. This plantation was situated on a rare type of grey clay which was then hand-formed into these irregular and large bricks. These bricks were a great boon after the 1820 fire that reduced huge swaths of the city to cinders. After the fire brick production boomed, and were used all throughout the city. They can still be seen around the Historic District. Production finally ceased, however, by the civil war, making these bricks representative of less than 60 years of history. The Ford Plantation, Ford's winter resort outside of Savannah, is built entirely out of recycled Savannah grey bricks. Photo courtesy of the Ford Plantation. The bricks make a beautiful, colorful and austere facade. The age has added a beautiful patina that will accent any wall. We are willing to sell the whole lot, 3,000 bricks at greatly reduced wholesale prices. Price available upon request. Please let us know if you'd like our bricks, and we'd love to see what purpose they end up serving! You can contact us here. One of our most treasured and historically interesting designs is our refectory table. The second table in its new home at the Grand Bohemian Mountain Brook. Photo courtesy of www.al.com. To make it we use an antique factory work table from the Kahn Company in Savannah as a frame, restored it, and inlaid the top with a herringbone pattern out of antique, also reclaimed, oak flooring, hand cut to fit. Currently our longest factory table in the shop: this one is 17 feet long and took nearly everyone's two hands to move! Another view of our 17 footer factory table. So far we’ve built two for the Kessler Collection, a series of luxury hotels expanding throughout the south-east. The first went to the Grand Bohemian Hotel in Charleston, SC and the second to the Grand Bohemian Hotel Mountain Brook, Birmingham, AL, which opened last Fall. As the name ‘bohemian’ may suggest, the style of the table hearkens back to the seventeenth century, where large tables such as these adorned castles and estates throughout Europe. Refectory table from England, ca. 1640, oak and elm. Photo courtesy of Axel Vervoordt. Refectory of the Mont Saint Michel Abbey, built between the tenth and sixteenth century, in France. Photo courtesy of John Dalkin. Now how a cloister lent its refectory table eventually to the Bohemian courts is a strange story to be told, but it can hedged in for comprehensibility’s sake. So, as the nobility in the Mediterranean, most notably in Italy, devoted their massive fortunes to equally massive castles and palaces (palazzi), they encountered also demand for larger dining tables, and as dining halls remniscent of refectories had also become fashionable at the time, the conclusion was to build refectory tables for the court dining halls. Refectory tables, ably secularized. They then flourished. France, also becoming massively wealthy, made its own equally wealthy castles (châteaus) and massive palaces. During this construction, an Italian designer and architect, Giulio Romano, traveled from Italy to oversee the development of the court of Francis I in the early 16th century. G. Romano is described by Vasari as “abounding in excellent qualities,” and excelling in ability. One of these was his reconstruction of much of Mantua. “For the city of Mantua at various times,” Vasari wrote, “he designed temples, chapels, houses, gardens, facades, and was so fond of decorating them that, by his industry, he rendered dry, healthy and pleasant places previously miry, full of stagnant water, and almost uninhabitable.” A Rennaisance reclaimer after our own heart. But in France, he is also credited with bringing the refectory table to the courts and castles. Seeing these wonderful designs and tables, they were imitated by the Germans, and had spread to Bohemia by the 17th century. Thus, our tables for the Bohemian have also remained true to history, from the mind of a legendary Italian architect. Detail of the table. The age of the wood is clearly visible, without intruding. I mentioned the the herringbone on our tabletop was made of oak pieces, which itself coheres with this narrative. Medeterranean tables of this kind were usually made from walnut, but in Northern Europe oak took its place, being more abundant. The finished reclaimed oak herringbone (technically à batons rompu) tabletop. Photo courtesy of www.al.com. Our refectory tables in the Bohemian Hotels are now serving primarially as stations for wine blending machines where guests may have their own custom wines blended, bottled and labeled. If you’re interested in one of these for your cloister, home, or palazzio, please feel free to contact us! First off, we hope everyone that happened to attend enjoyed their Savannah St. Patrick's day and Stopover Festival! We certainly did. In the aftermath of (what I'd designate as) Savannah's liveliest (of liveliest) of holidays, Stopover and St. Patrick's Day, we thought we'd take a minute to post a few stopover pictures. Measuring the boards before taking them over to the main venue, Ships of the Sea Museum. Olivia at work screwing together the table. All 30 feet visible, though the three bases are covered with the burlap. The bar at work, night one. A few of our architectural salvage pieces at Stopover Headquarters. We had the pleasure of recovering from Stopover at Richard Lane's stunning mid-century house with our friends. Here's relaxing Adam. Like every Stopover / St. Patrick's Day March, it's quite exhausting, but ultimately provides one of the glories of living in Savannah. See you next year! P.S. If you're interested in local music to chill to, check out our friends Triathalon. Thanks to them for hanging out. Aside from our specialty in longleaf pine, a more exotic type of flooring we work with is sustainable, reclaimed ipê (e-pay), also known as ironwood, or brazilian walnut. As the third name suggests, this wood generally hails from the dense forests of Brazil. Resplendent among types of wood used for decking and other outdoor purposes, ipê provides a study, nearly steel-tough, hardiness, due to the dense grain of the wood. So dense, in fact, that it often doesn’t float, is impermeable to water, and is nearly fireproof. Thus, it is exceptional for decks and the outdoors, but also provides hardy flooring that also looks beautiful, as untreated ipê, concieved in a myriad of gradient colors, often ages to a fine silver hue. There is, of course, a downside to these exceptional properties of the brazilian walnut. As it became more and more sought after on the market, extensive deforestation of sensitive rainforests resulted, and the emissions of these massive and environmentally lethal operations account for a significant percentage of human induced denigration. In response to this, sustainable methods have been introduced to regulate the exploitation of rainforests-harvested wood. We only use ipê certifiably harvested from sustainable practices. The practices currently used in harvesting brazilian walnut often involve pruning or cutting strictly only smaller growths, rather than the massive canopy trees, these being the only sizes which one can literally carry out of the forest. This provision excludes the clear-cutting of forests, which requires all thickets, plants, and trees be leveled, to even get the vehicles and machines used into the forest. These smaller trees (the ones allowed to be cut) as well as fallen boughs and dead trees are carried out and cut into boards for decking. They are then replaced and the forest remains upkept. This process might be the source of the name ipê, which, if it is understood on analogy of ‘ipecacuanha’ (low-creeping-emetic-plant), which begins with the word ipe, a shortening of ipeb (low, creeping). Thus ipê perhaps denotes the low, creeping parts of the whole Tabeuia tree. Although this is purely hypothetical. Ipê we installed for the Grand Bohemian Mountain Brook. Photo courtesy of photos.al.com. We took these rejects and fitted them, not into a deck, into flooring. The result is a stunning series of colors and grains on the floor, which all fit a similar palette, all siblings of the same kind of tree. Our ipê floors currently adorn approximately 7000ft2 of various rooms throughout the luxurious Grand Bohemian Mountain Brook in Birmingham. We recently were given this pair of massive and elegant Eastlake doors, and an ornate newel post from a friend of ours. Each are quite antique, and were salvaged from an Ohio home. They're at least one hundred years old, although they appear to be much older, due to their Victorian embellishments. Two large (93.5" H x 32" W x 1.5" D.) cottage doors from the Eastlake period. Simple ornamentation along the glazing, resembling strap work of the mannerist period. These doors belong in a beautiful home which can accommodate their size. They are missing their original lock and strike-plate, but we may have a set contemporary with it. This could be a wonderful way to modernize the doors, however, with an improved or custom lock. Escutcheons as well are missing, but we may be able to find the right replacement to fit whatever taste! Along with the cottage doors, is this 55" tall, 6 1/4" deep Victorian newel post, perfect for an antique staircase. It's hand carved, and very ornate, though a few parts have suffered damage through time and wear. The finial is also carved, and quite a nice rest for a palm ascending or descending the stairs. Beautifully carved chaplet moulding, with some beads missing. We'd love to send these to the perfect home, and have them back serving their respective purposes as soon a possible. So if you'd like these rare and beautiful artifacts in your home, please let us know. Each of our farm tables are made from reclaimed wood, and most often old-growth heart pine. This wood is from the original longleaf forests around Coastal Georgia, many of which were half a millennium old, and what we often use comes from hundred year old flooring or porch wood that we've salvaged from deconstruction work in historic Savannah. Thus each table bears hundreds of years of history, both untouched by colonization, and then integrated into our city's history. Since the wood itself is so old, it's also quite sturdy, allowing us to keep our designs slighter less cumbersome than many farm-style tables encountered. This is a great benefit for the modern home, which often hasn't the space to accommodate a huge table. (Of course we can make those too!). A first example is this variant of our standard farm table, readily distinguished by its yellow-green-grey apron embellished with trim from a Victorian porch we’ve reclaimed. We’ve derived many of our traditional heart pine boards from tattered old porches from Victorian homes, painted often to be eye-catching / appear appealingly, over a century ago. Thus we add ornament leaden with meaning to the whole of a table, while providing a functional apron, and a dash of color. The legs are modified cuts from circle sawn beams used as supports in Victorian homes, as you can see it still has nail markings and scratches from its long lifetime. The boards making the tabletop also have their own legacy, seen in the slightly irregular edge. The most remarkable part, I think, is the original paint from its original look as a porch. Their thin width shows just how sturdy the aged, tight grained wood remains. Another strange bit of history is this farm table made with haint-blue porch-wood. This type of paint was thought to ward off ghosts, and derives from the Gullah culture found in the Low Country. This yellow, ornate wood, adds quite an accent to the skirt. Of course we're also happy to make a simple, unembellished, unpainted variation of the table. This is thicker heart pine, with very sharp edges. Our "prototype" for these tables is a huge and original antique farm table which we keep at the shop for inspiration. We custom make all of our tables from pieces our customers hand-select. If you have any ideas, or like one of these, please contact us and we'd love to make it happen! Aside from providing reclaimed heart pine cabinets and a wardrobe for Fix It and Finish It, we also helped them renovate Ramsey's attic, to make a beautiful, historically accurate, room for his daughter, Laura. Photo courtesy of Fix It and Finish It. The house itself is Ramsey's, one of the last remaining plantation homes in Savannah, which he preserved by moving it to its current location, and completely restoring it. The attic hadn't yet been given a use, so when we worked with designer Nicki Huggins to turn it from storage into a dream room. The room itself consists of heart pine wood for the floor and vaulted ceiling, supported by massive beams. The wood is accurate to the age house, it was built in the early 1800s, and provides a warm interior. We also designed a hanging bed with reclaimed heart pine as a frame. Called the "Southern Arabian Nights" bed, it is suspended from beautiful beams supporting the roof, and the wood for the frame displays original saw-marking. The wood, like the walls, has been pickled, or whitewashed then wiped, which lightens the color, and alludes the antique nature of the house itself. We further designed and built the room a hanging desk, a minimal addition to save space in the small (27 foot!) room. It's also made of reclaimed heart pine. In terms of minimal design and micro-spaces, this piece is a favorite of ours. Our team installing the custom hanging bed's heart pine frame. Ramsey and Nicki discussing an antique pulley we added as a historical accent. Our team of builders and designers, also known as "the Gang." A great bunch of people! In the end, the room stunned us more than we could have hoped. It is a perfectly minimal, spacious and comfortable hide-away crowing the house. We certainly enjoyed this project, and Laura loved her new room. More videos are available on Nicki's vimeo, and you can catch the whole episode on Fix It and Finish It! One project we assisted on was the interior of the Grand Bohemian Charleston's upscale Élevé bar and wine tasting room. The Grand Bohemian belongs to hotelier Richard Kessler's Autograph Collection of boutique, designer hotels spanning the globe, each of which offer a cultured lifestyle along with their elaborate rooms, furnished with Bohemian-resemblant decor. Photo courtesy of the Grand Bohemian Charleston. The first of the collection was the Mansion on Forsyth, and quickly caught on elsewhere. We've worked with Mr. Kessler for a variety of projects, from flooring to custom furniture. For this hotel in particular, we provided reclaimed heart pine for the wall and overhang of the main bar, which accents the rustic charm of the whole establishment. It's quite flattering to us that our antique and aged wood serves as a centerpiece. We also built a massive refectory table out of one of our reclaimed antique factory worktables, which now serves as workspace and seat of their magnificent wine blending room. This room also features two large reclaimed doors we made and fitted. In the corner you can see one of two sliding barn doors we made out of reclaimed wood. They were custom ordered specially for this blending room, and look great! Also in this room is a custom heart pine shutter to accent the wine-supplies. The wine blending process has struck vino-thusia throughout the Charleston area, with quite a few wonderful articles about the actual process. At the hotel, classes are available to learn the craft and enjoy your own mixture. You can read about it (and see some nice pictures of the table!) here. The hotel is, in fact, the first stand-alone hotel offering wine mixing classes in the United States. You can learn more or sign up on the Wine Blending site. Photo courtesy of The Post and Courier. With the complexity of the process, it's relieving that the immense size of the table has enough room to accommodate, and leave all wine mixers and mixing comfortable. If you happen to be in Charleston, looking for a place to stay or a breathtaking bar to visit, think about Élevé, and tell us what you think about the wood, doors, shutter and table! A few years ago we supplied some beautiful reclaimed heart pine beams and columns for our friends at Gerald's Pig & Shrimp, when they moved to Tybee Island. The wood and beams are extremely old, sturdy, and look great in their current home! Gerald's Pig & Shrimp sells barbecue and locally caught seafood on Tybee Island. "Yes, the atmosphere of this stand is unexpected, and one you may not think you should try. But trust us, you really should. Do not miss this spot in all its funkdom." —A review of Gerald's in an article (see below) titled "Tybee Island: Going Back In Time"
It is an exceptional eatery, earning award after mention after anecdote after satisfied gustation, and its location assures magnifies it's character. For those of you who haven't been to Tybee, the only adequate description available is the phrase "Tybee Time" as a form of life, a bar (featuring frozen alcoholic slushies), a complaint, a sutra, a mantra, a suda, and a kind of spiritual exercise (for example, this article titled "Living on Tybee Time"). The present author, himself, learned to swim in one this environment's many semi-stagnant tidal pools. I hope that it can be inferred how excited we were to help Gerald. Gerald himself has an interesting Savannah story, taken from his website, "Back in the early 90’s Gerald Schantz, a Savannah native, a Vietnam era Navy veteran, a professional stained glass artisan and local theatre thespian happened upon an opportunity to cater a private party for the cast and crew of “This Old House” which John Berendt, author of Midnight in the Garden of Good and Evil was throwing. Before the event was over, Gerald found himself talking to the show’s producer who commissioned him to handle the company’s wrap party in Monterey Square. The event was so successful, the entrepreneur was able to purchase the first of several custom grills on wheels that formed the beginnings of his rolling catering service, GERALD’S CHUCKWAGON." So it should be obvious how great of an opportunity it was to help out such a fascinating person with such a spectacular restaurant. You can find see more on their Facebook.